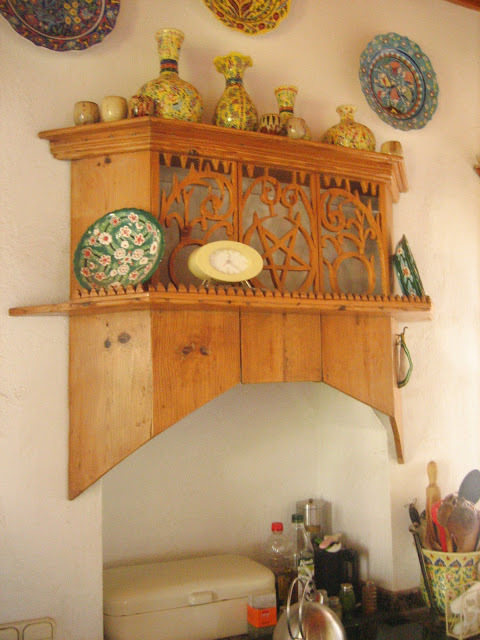 We wanted to show you today a special piece of our kitchen, other ways a standard Ikea kitchen, but to camouflage the aspirator, we used an antique mantel piece. 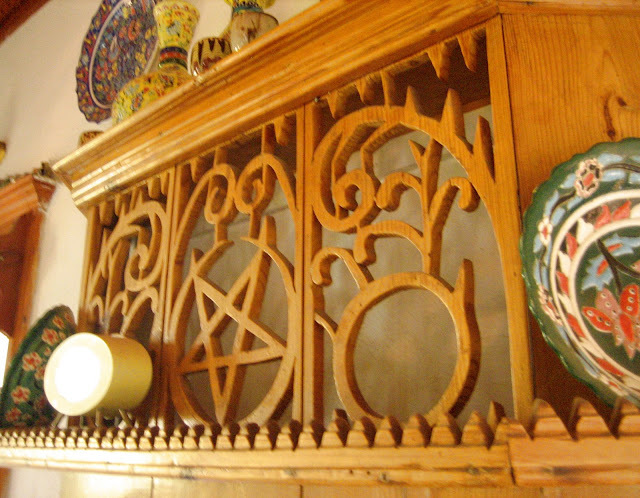 This wooden mantel is much older than the house, at least fifty years, but it blends wonderfully in the local architecture of the house with all the blond pine wood. 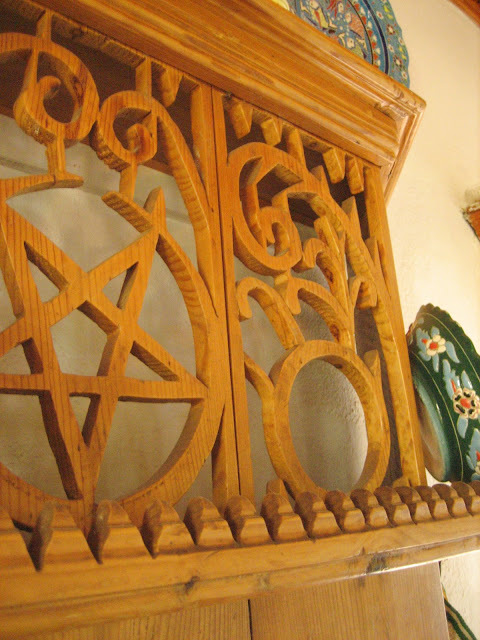 It is scroll saw, with the Islamic five point star in the center and vines and leaves at the sides. 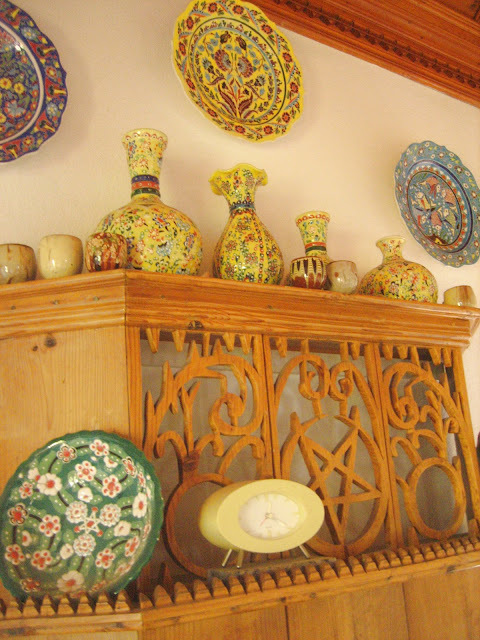 The ceramics on top are mostly from Kütahya (the florals) and Cappadocia (the small tan bowls). It is a lovely piece of folks art, all done with hand tools. 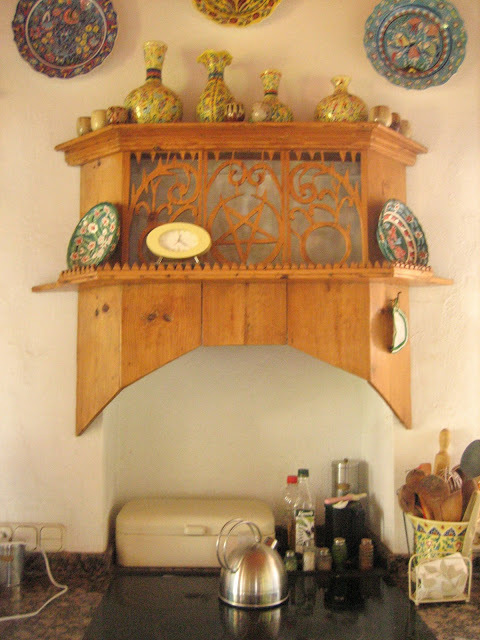 These type of mantel pieces are meant to be placed lower on the wall, above the hearth. We couldn't find decent pictures on the net, only two quite blurred ones, included to give you an idea. The traditional Turkish living room includes a hearth, where the woman cooks, sitting on her heels. 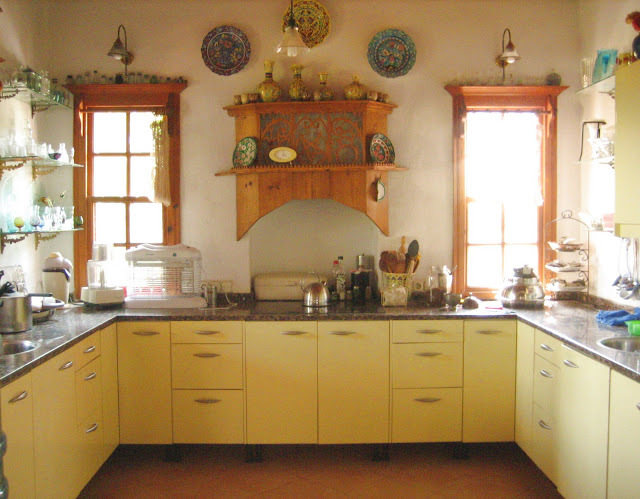 Usually, in that kind of houses, that still can be found in many rural places, there is no kitchen or indoor pluming. The room is multi functional, being sitting and dinner room during the day. Meals are eaten sitting cross legged on the floor, around a very large round tray. At night, bedding is pulled from under the settees and beds are made on the floor for the family. This is a fabulous post! Thank you for sharing! What beautifully detailed shelves and gorgeous patterned dishes! and I learn also some about Turkey from your posts. Different angle from my Istanbul view! What a nice kitchen you have. What a great way to hide the aspirator and character to the kitchen! I want to move in with you star! I love it when you share your home with us, it's so gorgeous and cozy! Wow, I love your pottery!! you have an beautiful home! !